Chairman of the Obama-Biden Transition team, Podesta has in recent years also has been President and CEO of the Center for American Progress, a liberal think tank in Washington that the New York Times dubbed as having been established to be the (Hillary) Clinton Administration in waiting. He is also currently a Professor of Law at Georgetown University Law Center (a position he also held previously from 1995 to 1997) where he has taught courses on technology policy, congressional investigations, legislation, copyright and public interest law. 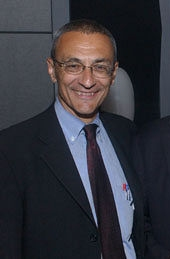 Growing up mainly in the Chicago area, Podesta attended Knox College Galesburg Illinois before earning a law degree from the Georgetown University Law Center in 1976. After a legal career in which he worked for the Department of Justice's Land and Natural Resources Division and also as a Special Assistant to ACTION, a federal volunteer agency in the late 1970s, he held a number of position on Capitol Hill in the 1980s. His time with the Clinton administration began in January 1993 when he started as the Assistant to the President, Staff Secretary and a senior policy adviser on government information, privacy, telecommunications security and regulatory policy. By 1995 he had served as Assistant to the President and as Deputy Chief of Staff. He became Clinton's Chief of Staff in 1998, holding the position until January 2001, and during which time he played a key role in introducing Executive Order 12958 (which created new standards for the process of classifying documents and led to an unprecedented effort to declassify millions of pages from the U.S. diplomatic and national security history) and also oversaw Clinton's pardons in the last days of his administration. In 2008, Podesta authored his book The Power of Progress: How America's Progressives Can (Once Again) Save Our Economy, Our Climate, and Our Country. In it, he articulates a vision of progressive values based on four core lessons: 1) Progressives stand with people, not privilege; 2) Progressives believe in the Common Good and a government that offers a hand up; 3) Progressives hold that all people are equal in the eyes of God and under the law; and 4) Progressives stand for universal human rights and cooperative global security. Center for American Progress Action Fund The Center for American Progress Action Fund is a progressive think-tank dedicated to improving the lives of Americans through ideas and action. Peter Kadzik "Marc Rich attorney"